Skype Voice Changer is a utility for changing voice when discussing in real time on Skype. This function can operate whether for voice or video conversations. 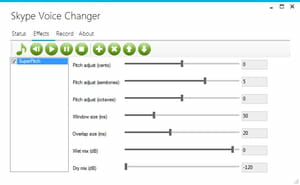 Skype Voice Changer is packed with several effects that the user can select to enhance and bring funny touch to the voice chat. Among them, he can choose the 3Band EQ with crossover, Flanger or SuperPitch. Other effects are available once the program downloaded. Each effect can be adjusted to the users' preference. Whether it is in terms of Threshold (dB), Makeup gain, Time Constant and AGC, they can all be adjusted. Note that the RMS level detector window is also configurable. Skype Voice Changer is immediately integrated to Skype's interface once downloaded and installed on the computer system. A click on the icon leads to all effects and options that are at users' disposal. Skype Voice Changer can be downloaded for free. It is simple to handle. Recording and playing back the conversation is not feasible with this standard version. Latest update on October 15, 2014 at 08:14 AM.